Tracks & Troops is quickly becoming one of my favorite accessory makers. This is a very unique item, one that I doubt we'll see anywhere else. The platypus grousers were used to both improve traction in soft terrain, as well as decrease the ground pressure of the tank. Two types of grouser are included in this set: the normal grouser with no extensions (pictured on the top in the above scan) and the grousers with the extended end connectors, which were the "platypus" grousers (pictured on the bottom in the above scan). 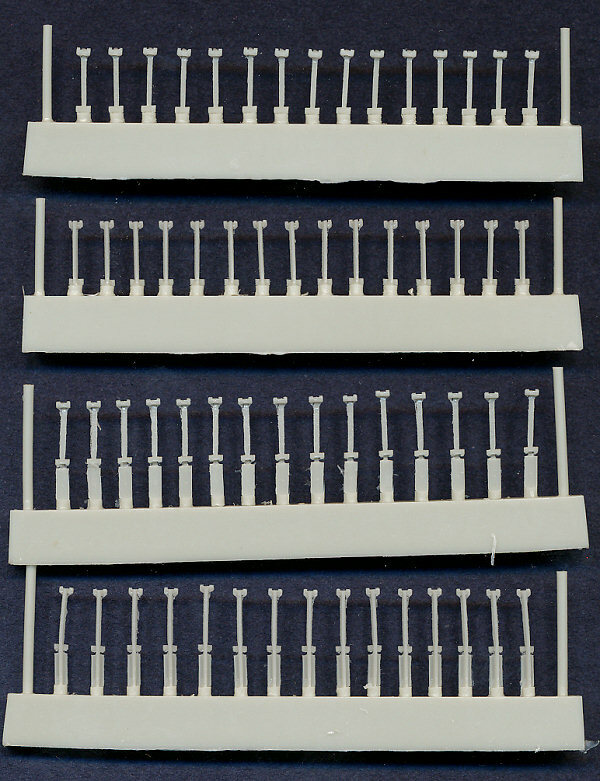 Four sprues are shown in the scan above: the two on the top are the normal grousers, front and back; and the two on the bottom are the platypus grousers, front and back. There are six sprues of each, giving 90 of each grouser. Since there are supposed to be 79 track shoes on each side of the tank, this gives us a few spares. It was common to see the platypus grousers alternating with normal grousers, and indeed, with the number of paltypus grousers included in the set, it's not possible to completely outfit a tank model with only this type of grouser.